1450's. The symbol for Our Lady of Undercroft at Canterbury. 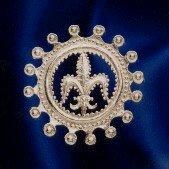 The fleur de Lis represents the Lily, or the Flower of Innocence. Diameter 3.5cm.